gateways for smart home and industry products. It includes a multiprotocol 2,4 GHz radio (featuring 4 dBm output power with -97 dBm sensitivity at 1Mbps in Bluetooth 5 mode), a 64 MHz, 32-bit Arm Cortex M4 processor, and 192 KB of Flash and 24 KB of RAM memory. It also comes with a wide range of analog and digital interfaces. 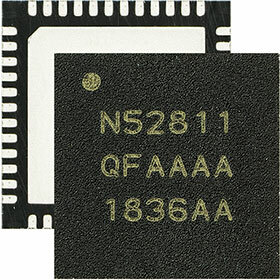 The chip is accompanied by an updated version (v15.3.0) of Nordic’s nRF5 software development kit which includes a Bluetooth 5 certified RF software protocol stack.